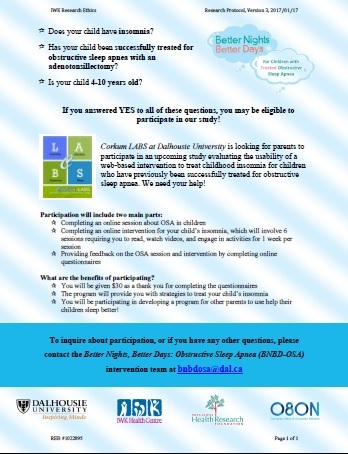 Folks at Dalhousie University are conducting a pediatric sleep research study on children with insomnia. Specifically, they are seeking parents of 4-10 year old children with insomnia. The children must have previously been diagnosed with Obstructive Sleep Apnea, and must have had it successfully treated with surgery; tonsillectomy, adenoidectomy or adenotonsillectomy. Please see the informational poster which gives more details about the project and whom to contact if your child fits the criteria and you are interested in having them participate.